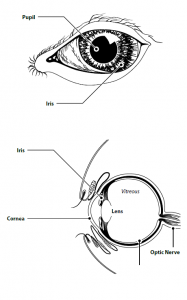 The uvea is the major blood supply to the eye and is comprised of the iris, ciliary body, and choroid. These major structures of the eye are very sensitive and perform numerous functions required for ocular homeostasis and vision. Uveitis is inflammation of these structures and results in pain, cloudiness to the intraocular fluids, and in severe cases, blindness. Uveitis can occur for many reasons, and depending on what the ophthalmologist finds on your pet’s examination, they may be able to determine the most likely cause. Further diagnostics with blood tests, radiographs, or ultrasounds may be recommended. In severe cases with pain that is unresponsive to therapy, surgery may also be recommended. Immune mediated (similar to Lupus or Rheumatoid arthritis in people), the body’s own immune system begins to attack the uvea, causing inflammation throughout the eye. This is a diagnosis of exclusion (rule out other causes) and usually responds well to treatment, but lifelong therapy is required to maintain control. Regardless of cause, uveitis requires treatment to try to prevent secondary glaucoma, permanent blindness, and pain. Medications should be continued unless specifically instructed to discontinue them, even if you feel your pet is improving. Discontinuing medications too soon can cause severe relapse of disease and secondary complications. Call immediately if your pet begins to show new symptoms with the eyes or systemically such as vomiting, diarrhea, or lethargy. Complete Blood Count (CBC): This is a blood test that evaluates red blood cell, white blood cell and platelet counts to determine if they are abnormal related to your pet’s uveitis. If cancer is present in the bone marrow, it will also likely show up on this test. Chemistry Profile: This is a blood test that evaluates for severe liver and kidney disease as well as shows electrolyte and protein levels in the blood to determine if they are abnormal related to your pet’s uveitis. Tick titers: This is a blood test that evaluates for exposure to tick disease and determines if a tick-borne infection is likely the cause of your pet’s uveitis. This test is very sensitive to rule out tick related disease. Fungal titers: This is a blood (and sometimes urine) test that supports whether fungal infection is likely the cause of your pet’s uveitis. This test is very specific to diagnose fungal infection, but sometimes there are false-negative results. Cancer screening: Radiographs of the chest and an abdominal ultrasound performed by a radiologist are the best tools for screening for cancer. If signs of cancer are found elsewhere in the body, samples can be taken non-invasively to help try to obtain a complete diagnosis, prognosis, and therapy options.